s w e e t p u r l s: Twins! I am the proud mama of twin...socks! They are fraternal. It wasn't planned. Is what happens when one buy too much yarn. But, who am I to judge? The first pair was knit with Regia 4 ply in color 7200 Moewe. 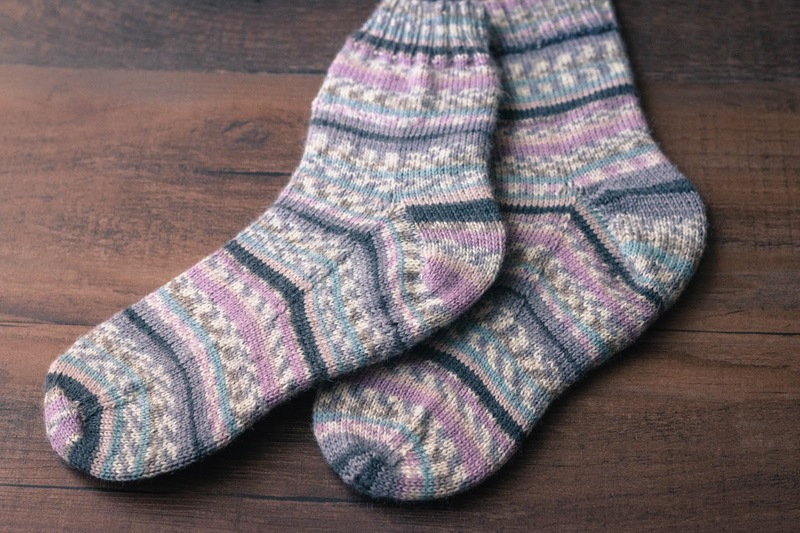 Both pair of socks softened when blocked. They fit wonderfully! I guess one cannot go wrong with either Regia or Opal - both workhorse yarns with fun (similar) colors. Thanks Maryse! Get some Regia and/or Opal if you can...yarn is not as soft when you knit but it feels much nicer when washed. And the colors are fun, in my opinion. Have a wonderful week. Agreed. I was feeling all proud of myself when I knit down all my Opal yarn. Then I had panicked feelings that I didn't have any more Opal yarn in my stash. That's a problem that has since been remedied. Audry!! Thanks for coming back to sweetpurls. Like that you have some Opal in your life :-) Have a great week xoxox!